The 55-inch Panasonic TX-55FZ952B combines superb UHD image quality, including the best HDR performance we’ve yet seen from a Panasonic screen, with a great sound system and attractive design. There's a very good reason that Hollywood video editors master on OLED TVs - they simply outmatch anything else on the market. And while LG and Sony certainly have their merits in this area (the former is the largest producer of OLED panels in the entire world, after all), Panasonic is certainly no slouch in this arena. All you need to do is look at the Panasonic FZ952, the latest OLED reference TV from Panasonic, to see why. Certified UHD Premium with a matching seal of approval by THX, this 4K model is available in both 55- and 65-inch screens sizes (TX-55FZ952B and TX-65-FZ952B respectively) but referred to as the FZ950 in territories outside the UK where it does not have a Freeview Play tuner, this OLED champion bristles with the tastiest TV tech that Panasonic can dish up. Despite having a panel shared by many of the top OLEDs this year, the FZ952 is cosmetically uncompromising. A distillation of last year’s EZ1002 OLED, it once again features a separate sound bar, aka the Dynamic Blade Speaker. However, this time, the design is slightly different. The soundbar bolts to the central pedestal, and is tethered, via a chunky cable, to a connector positioned beneath the screen’s logo. It cuts a distinctive silhouette, which sets it apart from many other flatscreens. While the TV and Dynamic Blade speaker will sit neatly on appropriately wide AV furniture, the panel also comes with an alternative mounting kit, which enables the soundbar to be bolted in a downward orientation for wall mounting. There’s quite a lot of heavy metal involved in the mount, but rather neatly, snap-on modesty panels hide the nuts and bolts. The end result actually looks quite neat. Connections are hidden behind a pop-off panel. There are four HDMI inputs, one with ARC; all are 4K HDCP enabled, but only two are full bandwidth. Consequently, you can’t run Sky Q 2160p with 10-bit colour into HDMIs 3 or 4. There’s also trio of USB ports (one a fast v2.0 for timeshifting onto an external drive), an SD card reader, component and phono stereo audio inputs, a digital optical audio output for external sound system use and Ethernet, to supplement the on-board Wi-Fi. The TV ships with two remotes, both familiar from previous Panasonic flatpanels. There’s a reassuringly hefty IR remote control, with a premium hairline finish and dedicated Netflix button, and a simpler Bluetooth touch remote. Design TL;DR: With a narrow bezel and slick bolt-on soundbar, the all-black FZ952 wouldn’t look out of place in Bruce’s Batcave. There are no big change to Panasonic’s smart platform this year. My Home Screen (here in its third iteration), derived from the original open source Firefox OS, refers to itself simply as Home during the tutorial and remains refreshingly lean. A trio of buttons (Live TV, Apps and Devices) provide fast access, but if you want more, you can add on-screen shortcuts for other services or inputs. Freeview Play ensures a full range of catch-up, including BBC iPlayer, ITVhub, All4, My5, BBC News & Sport and UK Play. The BBC iPlayer app supports MPEG Dash and is compatible with Auntie’s Live 4K streaming World Cup trial. In addition, there’s Netflix, Amazon Prime Video, Rakuten TV, YouTube Chili Cinema. 4K and HDR is supported where available. 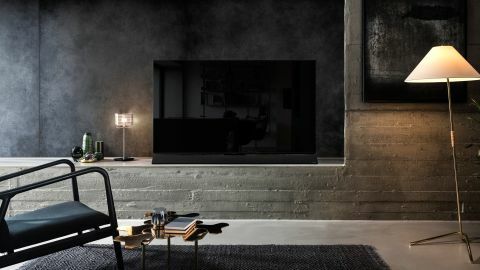 Smart TV TL;DR: Clean and minimalistic, Panasonic’s smart portal doesn’t try too hard to be clever - and we love it for that. Freeview Play offers the catch-Up you need, and all key streaming services are onboard, too. Straight from the box, this OLED impresses. HD SDR images are sharp, vibrant and naturalistic. The menus offer a wealth of presets - Normal, Dynamic, Cinema, THX Cinema, THX Bright Room, True Cinema, Custom, (ISF) Professional 1 and professional 2 and Sport - with deeper adjustments you won’t feel a need to visit. The set’s picture performance depends significantly on which preset you select. The Normal viewing mode (often referred to as Standard by other brands), is the best choice for most content, when goggle-boxing in rooms with average ambient light. The Dynamic mode has a tendency to over saturate colours, but can actually look rather fetching, as does Sport. If you want to take the wind out of the FZ952’s sails, select either the THX Cinema or THX Bright Room modes, or the two Professional 1 and Professional 2 modes. These subdue colour and contrast, and are not recommended. Panel luminance is variable, and indicative of performance. In the Normal and Cinema SDR defaults, it sits at 60%. Dynamic and Sport modes up this to 100%. THX, on the other hand, drops panel luminance to just 30% (dim, dim, dim), restoring it to 60 for THX bright Room. True Cinema is also just 30%. Professional modes have panel luminance set at 60 and 30 respectively. The set does a beautiful job with Sky Q HD, OTT streams and Blu-ray. There’s oodles of detail and texture, and a richness to hues which is eye-catching. The Flash has never looked flashier. The set’s UHD performance is fabulous, with high frequency detail beautifully presented. When fed 4K HDR, all picture modes lock contrast and panel luminance at 100%. Preset differences then come down to colour intensity, sharpness and colour temperature. The Cinema mode, which is unwatchable in a moderately lit room with HD, is rather more useful with HDR. The True Cinema mode, expertly tuned to replicate the same picture characteristics of a Hollywood mastering monitor, only really convinces in near dark viewing conditions. Wide colour fidelity borders on astonishing. There’s a level of nuance and richness to its images that I don’t think I’ve seen pulled from 4K Blu-rays before. Panasonic’s second generation HCX Studio Colour video processing can take much of the credit for this. New Dynamic LUT (Look Up Table) technology, which constantly analyses the picture information in order to improve the accuracy of bright colours, is clearly working some magic here. HDR support covers HDR10, HLG and HDR10+ although the latter remains an unknown quality. There’s no packaged media available, and while Amazon streams some of its HDR as HDR10+, it’s not flagged so you really can’t tell what you’re watching. The set’s HDR performance represents a huge leap from what we saw last year from Panasonic. I measured peak luminance around 750 cd/m2 (aka nits) using a 10 per cent HDR window, but reducing this to a smaller 5 per cent window saw peaks jump to around 900 cd/m2. Given that most specular highlights are small and fleeting, it’s clear this set has no problem handling HDR material (which often doesn’t come anywhere near this). But HDR isn’t just about bright peaks, it’s also crucially about near black performance, and this set does a marvellous job differentiating detail within shadows and low light scenes. Panasonic’s Absolute Black Filter lends images tremendous depth. Who needs 3D when there’s such spatial delineation on show? Lastly, in Game mode, the set offers a low image lag performance of 21ms, probably enough to maintain an edge in Fortnite. IFC motion handling impresses, so long as you keep to the Min setting. Don’t use the Black Frame Insertion mode. 4K/HDR Performance TL;DR: Panasonic has seriously upped the ante this year when it comes to HDR performance. Capable of bright specular highlights and superb low level detail, it absolutely nails 4K UHD. The set’s Dynamic Blade soundbar once again tuned by Technics, is actually even better than the version supplied with the EZ1002. This revised enclosure features four woofers, a quartet of mid-range drivers, two tweeters, and a quad passive radiator to boost bass. Mid-range clarity is actually better than last year’s offering, improving dialogue. It goes appreciably louder, too. If the FZ952 does sonically disappoint, it’s because it lacks a Dolby Atmos decoder. Unlike rival screens from Sony and LG, it can’t bitstream out Atmos audio to an appropriately equipped sound system. This means no Atmos from the Netflix client, or re-routed from connected sources, such as a Sky Q or BT TV set top box. There are rich pickings to be had at the rarefied end of the TV market. If you hanker after a premium big brand OLED. LG has a bafflingly wide range of models. All bar the cheapest use the same panel and image processing tech, so make your decision based on price, audio option and design. The LG C8 OLED is a great all-rounder, with a formidable specification. All key HDR flavours are supported (excluding HDR10+) and there’s Dolby Atmos audio. The rival Sony AF8 has a comparable roster of features, but adds an acoustic surface sound system, wherein the panel itself produces audio. The FZ952 is a luscious OLED that puts performance first. Its colour handling is class-leading, and its HDR talents are a match for any of its rivals. In fact, it just might offer the best picture performance that we’ve seen on a 4K OLED to date. The FZ952 isn’t the complete package, lacking as it does Dolby Vision and Atmos compatibility, but it wins more arguments than it loses. We suspect you’ll appreciate the easy sophistication of its smart platform, the quality of that low-lag game mode, and the sheer musicality of the Technics soundbar. The FZ952 4K OLED TV is a bonafide knockout.